Lately I’ve come to realize that I just do not get out enough. It’s so easy to stay cooped up at home and miss so much that life has to offer. Like food. Good food. 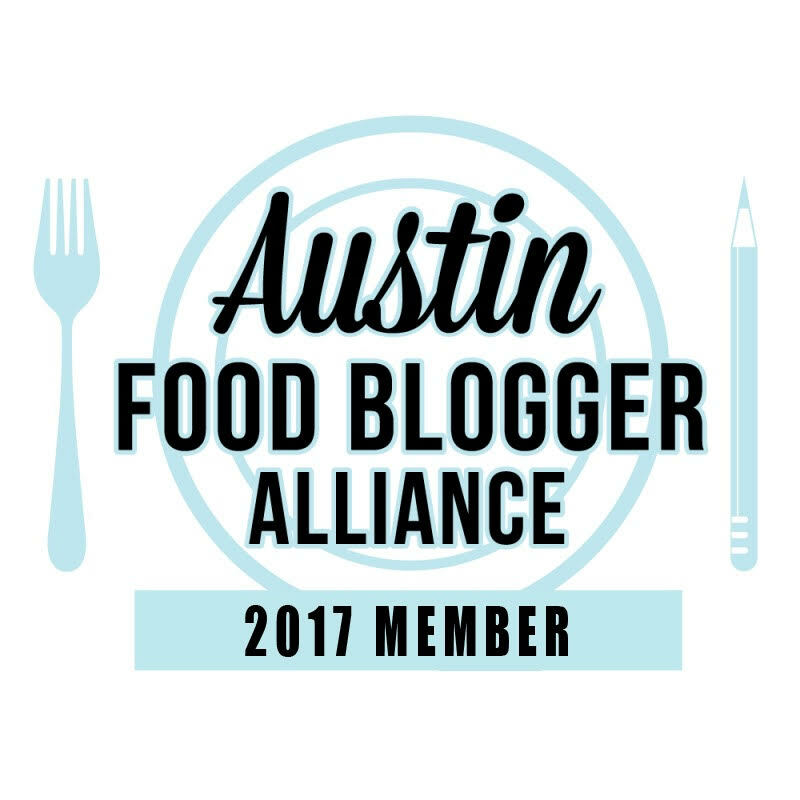 That was never more apparent than being at the BlogHer Food conference earlier this year and watching all these well-known bloggers eat at places in Austin that I had yet to try. And I’ve lived in this area most of my life. So I’ve made a plan. I’m going to try a new-to-me place in Austin once a month. For me that’s a good plan. Hopefully it will be more than that but not less. 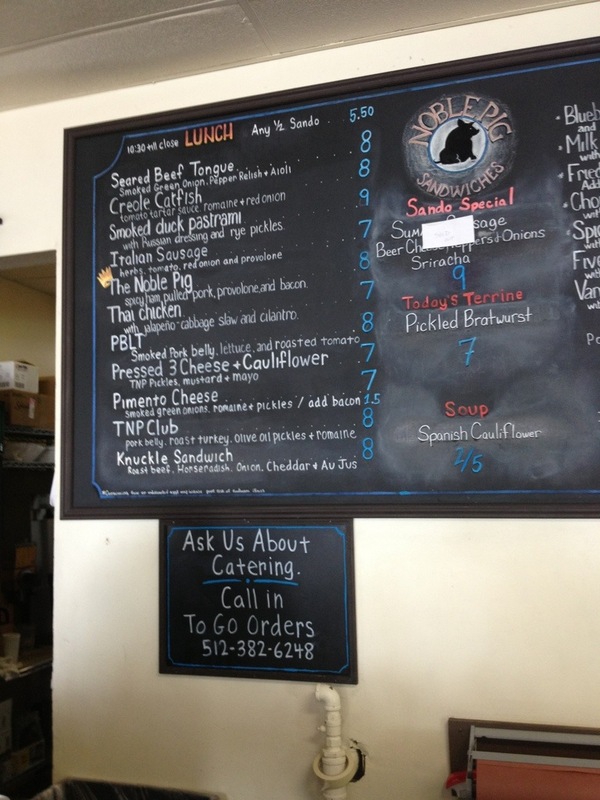 The first place I scratched off my Austin Food Bucket List was Noble Pig Sandwiches. This particular place was seen on the Food Network’s Diners, Drive-Ins and Dives. The disco ball is what got me. And the Mexican chef speaking in Spanish. And the pig. Lots and lots of pig. This past Saturday I met up with a couple of blogging buddies there as we went in search of the perfect sandwich. First, lets start with the location. This place is in North Austin. So north I think Cedar Park might claim it. But it was easy to find. Once I called the place and asked where I was going. It’s in a teeny tiny strip and they take their parking seriously here. But once you get a spot you are golden. Now head on in and place your order. The staff was friendly and patient as I perused the menu. We each got the Noble Pig. I mean who wouldn’t get it with bacon, ham and pulled pork included. Besides that, it had a crown on it and with the wee royal baby just having been born it felt like a sign to me. Of course, I was the only one who got a side order and dessert. But it was all for you folks. I can’t give a decent review without having a full meal. Amiright? I thought to order pickles because I’ve heard they help with leg cramps. But these were pickled pickles with carrots in a jar. I got a little scared and quickly said no thank you. We ordered then headed outside to sit at one of the picnic benches they have available. I will say be aware of the red ants. I didn’t get bit but they were walking around trying to get some of that pork. It didn’t take long for our orders to come. 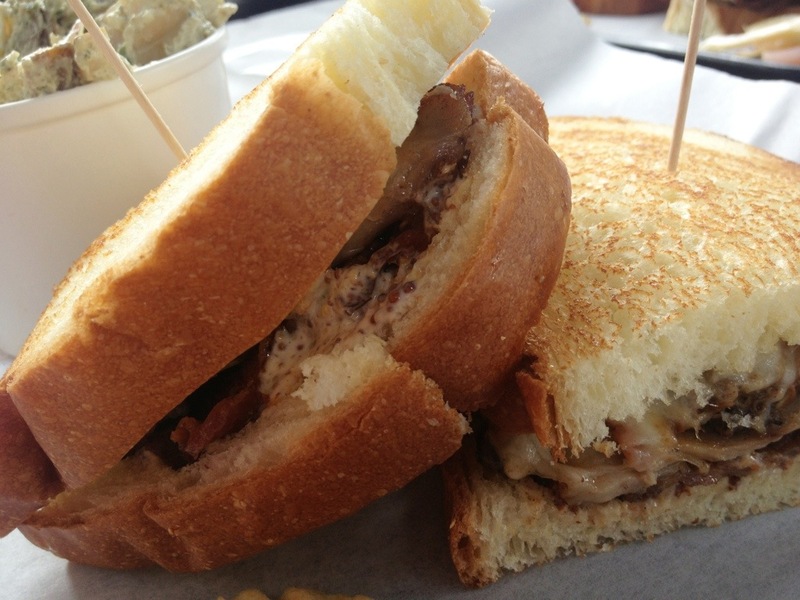 The Noble Pig came with a spicy mustard that just added to the deliciousness that was this sandwich. Seriously. How can you not love a bacon, pulled pork, ham sandwich? It was huge too so I took half of mine to my dad and he ate it the next day. Even then he raved about it. 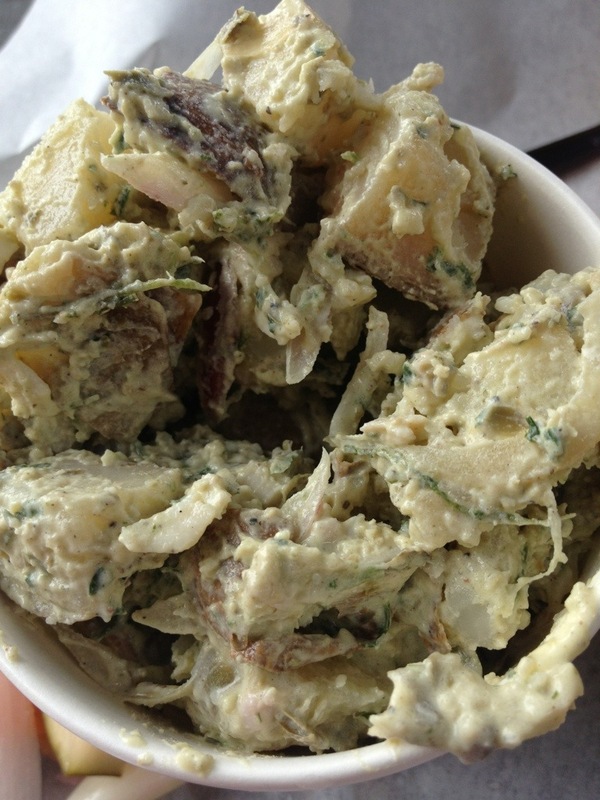 The potato salad was also a nice side dish but, to be honest, I didn’t need it. The sandwiches come with a handful of chips and those were enough for me. I’m not sure why I didn’t take the potato salad to my dad as I’m sure he would have loved it. Now when I saw they had tarts for dessert I gazed longingly at them but was going to resist. Even for you guys. 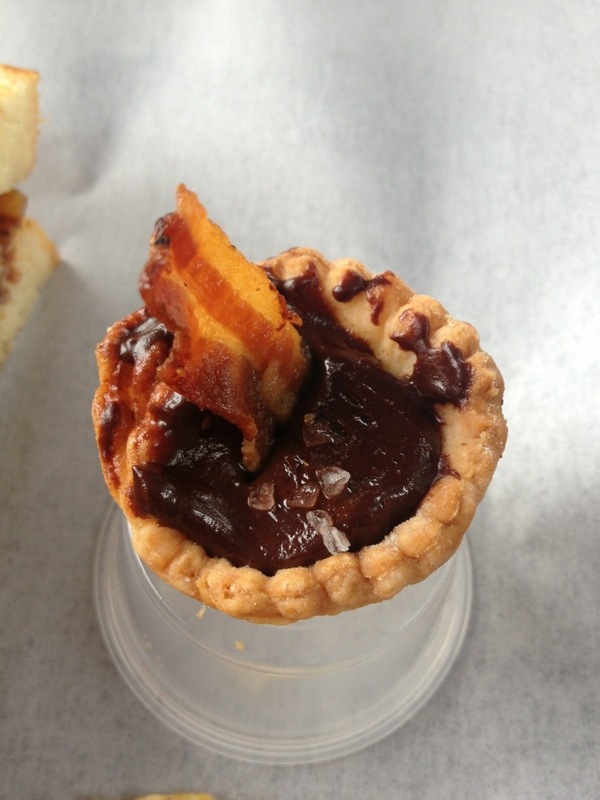 But then the staffer said that one is chocolate with bacon and I’m pretty sure I said I’ll take it before she even finished saying bacon. I ate the tart later that evening and it was such a good combo. I’m sure I’ll be recreating it here on the blog soon. Or even for a wedding shower. 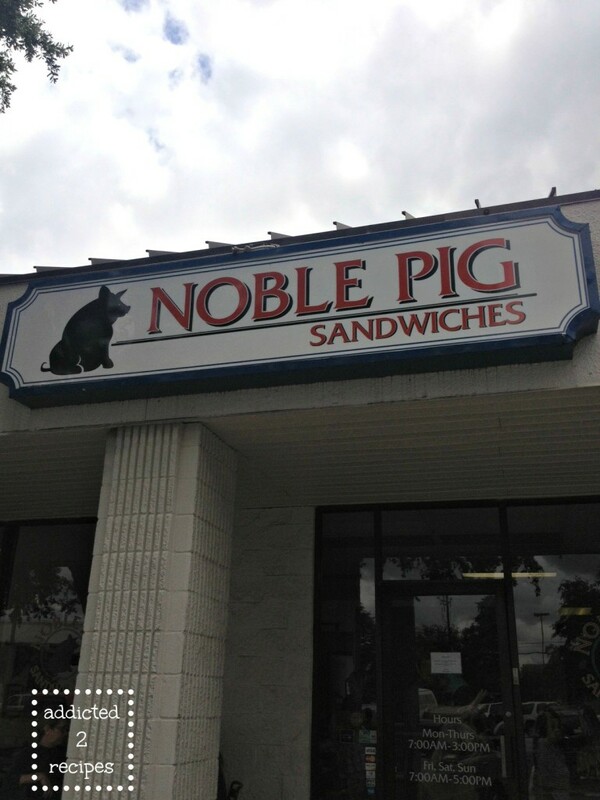 I’ll definitely be back to the Noble Pig Sandwiches. When I got a load of the breakfast menu I was already thinking of when I could make it out there again to eat off that side of the menu. I’ll be back Noble Pig. Yes I will. I definitely will let you know Julie. Thanks!